One of the treasures of our museum at South Mountain Heritage Society is the historic Pomplitz and Rodewald Pipe Organ, which stands just to the side of the chancel in the old Resurrection Reformed Church. Surviving the ravages of time, war, and neglect, this historic instrument is remarkably well preserved. Visitors to the museum have the chance to see an example of hundreds of years of technology represented in this small instrument. August Pomplitz was born in Prussia in 1825, and apprenticed with the great German organ builder Eberhardt Walcker. After immigrating to the United States, he opened his own manufacturing business in Baltimore, partnering with Henry Rodewald in 1851. The firm of Pomplitz and Rodewald produced pipe organs until 1862, at which time Rodewald withdrew from the firm. Pomplitz continued producing organs until his death in 1877, at which time his son took over the company. Over its history, the Pomplitz Organ Company produced an estimated 225 instruments, mainly in the Mid-Atlantic region. It is not known exactly when the organ at Resurrection Reformed Church was installed, but the name plate above the manual (keyboard) bears both the Pomplitz and Rodewald names, which indicates it was constructed sometime between 1851 and 1862. This places the organ among the oldest in the state of Maryland, and certainly among the oldest in their original locations. In all likelihood, the organ was in place when the Battle of South Mountain occurred on September 14, 1862, and damaged ornamental parts of the organ suggest that is was in the church when the building was being used as a hospital during the four months succeeding the battle, although records do not mention the instrument being damaged. The organ at South Mountain Heritage Society is a small instrument, of 2 ranks, or sections of pipes. The forward rank contains tin pipes, and the second rank contains wood pipes. All together, there are approximately 120 pipes in the organ. These pipes are controlled from a single, 54-key manual and a 13-note pedal board. Four stops, situated in pairs of 2 on either side of the manual, control different ranks of the organ. Only one of these stops maintains its ivory label, the stop for the principal, which is the foundation sound of the instrument. To power the instrument, a handle on the side of the organ has to be pumped, which opens the large bellows in the base of the organ. From here, air is pumped into wind chests, or wooden boxes on which the pipes rest. When a key is pressed, it pulls a long wooden rod, known as a tracker, which opens a valve under the pipe. Air from the wind chest enters the pipe and the vibration from the air produces the sound. A string attached to the bellows lowers a small lead counterweight on the outside of the organ case, which lets the person pumping the organ know how much air is left in the instrument. This complex machine represents centuries of organ design and construction, making this a small example of the same instruments the great composers like Bach and Handel played in Europe. The entire instrument is mechanical, and the only electric component of the organ is the light which hangs over the manual. 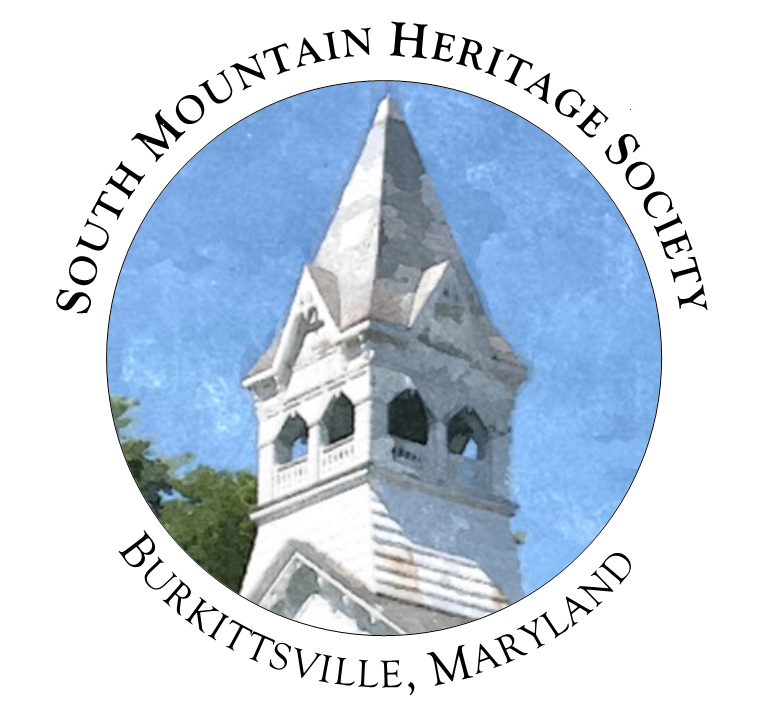 Within the collection at South Mountain Heritage Society are numerous hymnals and music books, dating back to 1866. From these artifacts, we are able to recreate the auditory environment which Burkittsville residents witnessed in this history structure going back to the Civil War era., by playing the hymns which they sung on the same organ which they heard. This is one of the greatest components of our interpretation program here at South Mountain Heritage Society. Visit the museum to get a chance to see (and hear) the historic Pomplitz and Rodewald Pipe Organ!